Conveniently accessible from Soi Diana Inn and Soi Buakhao is the Soi LK Metro, comprising of various bars, guesthouses, go-gos and hotels, restaurants, travel agents, internet cafes and even laundries. This website provides you the latest information about this tiny corner of Pattaya City for free, allow us to be your travel guide and information site to Soi LK Metro Pattaya. This little street promises not just to be better than Sois 6, 7, 8 and Pattayaland 2, but even better than Walking Street! Nevertheless, no matter which corner you're in, lots of beer, beautiful Thai girls, lovely ladies of Pattaya working as hostesses to please you and accommodation would be your major requirements while you're in Pattaya Beach, so we'll let you be the judge! And for those who can't afford luxury accommodation, Soi LK Metro in Pattaya would be perfect as they have several guesthouse and apartment in and around this area which provide very cheap accommodation choices. Some of the venues are set up to portray as luxurious gentlemen's clubs and most of them compete with eachother as cheap guesthouses or even short time rooms so it is always easy to find a better and cheaper deal with the least of haggling and the same principle applies to bars and gogos as the happy hours never stop due to the competition, from cheap draught beers, soft drinks and cocktails to spirits. There's no doubt that there are even more cheaper options for lodging such as lodges, condominiums (studios/condos), villas and houses which are openly available for rent monthly or even longer term rentals in other (less popular) parts of Pattaya where most of the long time dwellers like to stay and Soi LK Metro is renowned as the heaven for retired people, baby boomers, expats and pensioners to party so this can be your cheap home in Thailand! So pack your bags and prepare yourself to get on a journey and travel to Thailand's party town. Come on over and give it a try, Soi LK Metro Pattaya, Thailand! Thanks to several emails we received from our viewers, we have now introduced a special page which lists the Most Guest Friendly Hotels of Pattaya (a.k.a. Working Girl Friendly Hotels) and those hotels which have no joiner fees. Recently the South Pattaya, Third Road in South Pattaya, Bali Hai and Phratamnak areas have become very well known with tourists to frequent during their visit to Pattaya. Many travelers prefer staying in these areas as they are close to Walking Street and obviously Soi Buakhao and Soi LK Metro as well. Below are some of the useful sites we recently found related to hotels in South Pattaya and also bars and nightclubs on Third Road in South Pattaya, in Bali Hai and in Pratumnak and Thappraya. Below are some of the useful sites we recently found related to Guest friend Hotel in South Pattaya, Third Road in South Pattaya, Bali Hai Pier, Phratumnak and Thappraya areas. Here are some sites which can give you information on Hotels in Walking Street or hotel near Walking Street in south Pattaya and Bali Hai Pier which is the south side entrance of the famous Pattaya Walking Street. Traveling in Pattaya, you will certainly need a Joiner Friendly Hotel so here are very useful resources regarding Joiner friendly hotels or Girl friendly hotels in south Pattaya and Bali Hai Pier which is the south side entrance of the famous Pattaya Walking Street and even near Phratumnak Hill and Thappraya Road areas. 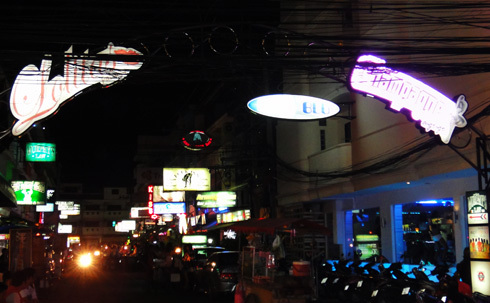 The South Pattaya area is very famous for its legendary Walking Street, certainly Soi Buakhao and Soi LK Metro, several massage parlours, bars, discos and nightclubs and if you are one of those who prefers to be in the middle of the action then South Pattaya gives you access to all of these and so here's the list of sites with some really nice South Pattaya Hotels, stay in the very heart of the action!